Apparently this whiny hypocrite has an issue with people exercising their Freedom of Speech, and is a low-life who finds it okay to personally insult people he or she has never met. I received a "complaint" from Robin Phillips about my posting a complaint about a Toyota dealer. Apparently she (or he) can complain/personally insult people but no one else can. 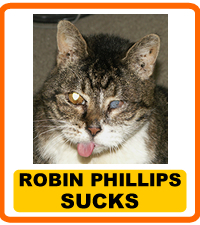 It looks like Robin Phillips raises cats and has had a website under construction for several years.